No rain for a couple of days, the river will be dropping and the water clearing up, it’s time to go fishing. 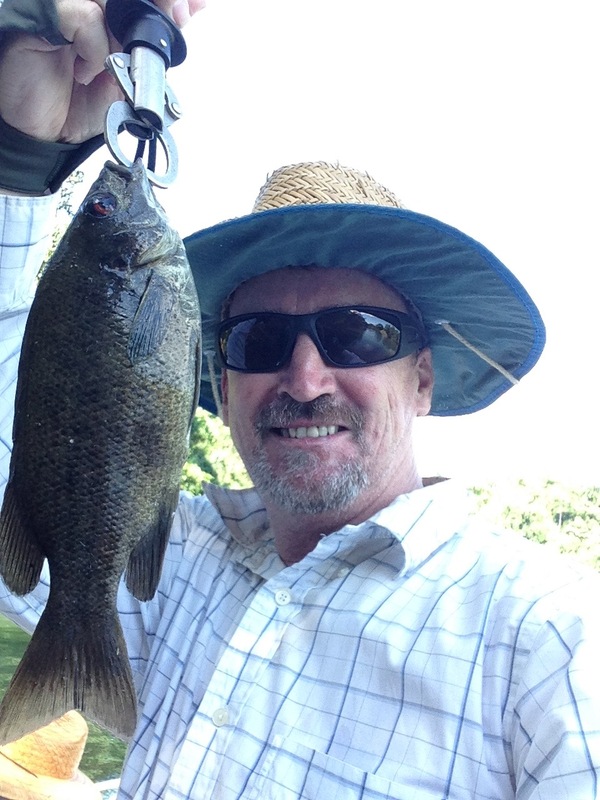 “Morning Parksy, great day to wet a line”) I’d picked up my mate Brod Osbourne (at this point he had no idea what a fantastic day it was going to be) and headed of down the highway in search of the elusive Jungle Perch. 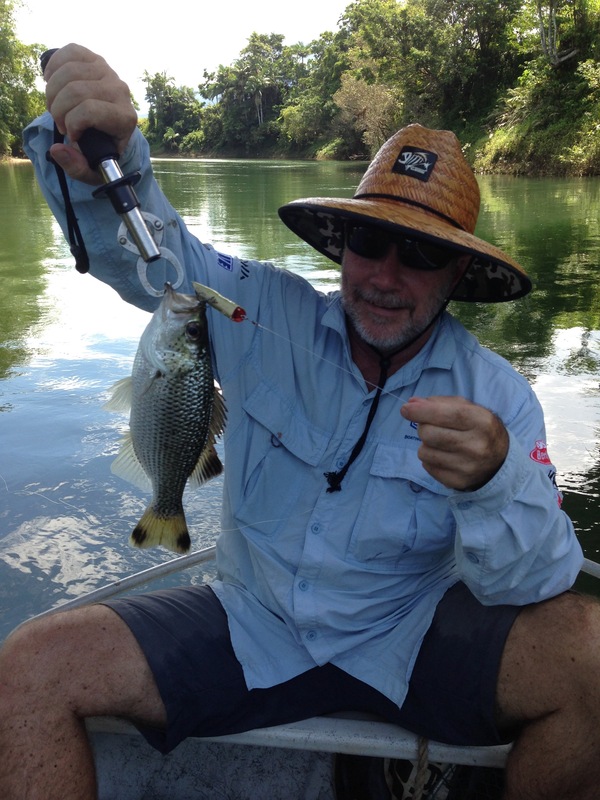 Brod had spent a good part of his youth growing up in Babinda (50-60km south of Cairns), and despite spending many weekends on the river had never caught one. It was beautiful morning, a light breeze was forecast and there were only a few wispy clouds in the sky. We hit the river and headed upstream. My trusty Quintrex Explorer knew the way, as it had been up here plenty of times. Brod held his breath a few times as we traversed some gentle rapids and he saw the rocky bottom of the river flash past only inches from the prop. There was still plenty of fresh water coming down the river, that meant we could get further upstream. We finally arrived at our starting point, way up river, the furthest point I had been so far, and I’d only gotten here once a few weeks back. That particular day this part of the river did not produce many fish, but on that day also I had to contend with a crop duster spraying crops for the local farmers. We pulled in to the bank at a small back eddy and set about attaching lures to our rods. Directly across the river was another larger piece of backwater and we proceeded to cast our lures into it, second cast and bang I was on , third cast for Brod and he was on, I brought in a lovely little JP, and Brod landed a nice little Sooty Grunter. Hadn’t been fishing for five minutes and we were both on the board, time for a quick photo, a fast release, the back into it. They were on, I got another, Brod got another, then me, then him, the tallies were starting to rack up. I’d put four JP’s in the boat and Brod had landed five Sooty’s, the Sooty king was not happy, he was yearning for that first Jungle Perch. What made it worse was, a few times my casts were bringing out into the open small groups of JP’s all chasing the lure. Jungle Perch love to lay in wait for their food in shaded areas, generally near the bank, so fishing for them requires some precision casting at times. Hit the right spot and the fish are on before the bail arm has time to be flicked back over. They are great little fighting fish, and hit the line hard, but they also have to be one of the most attractive looking fish going around. 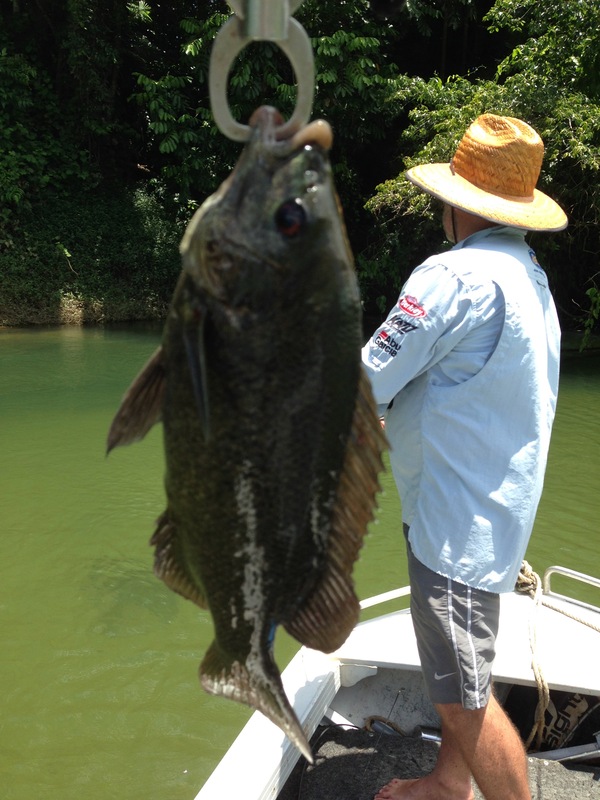 Their distinctive marking make them the fish I love to catch the most. 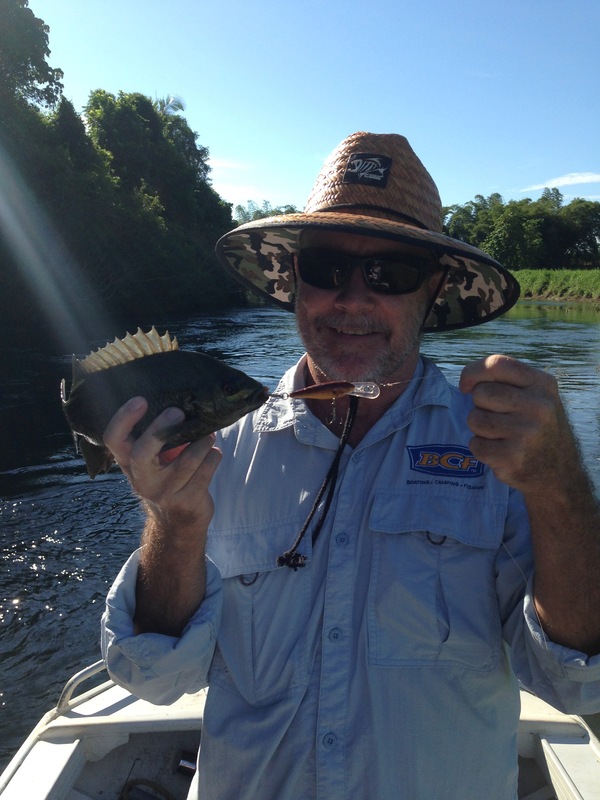 We were using the Rapala SR5 lures, I had on a light/dark green version, and Brod had the gold/black, by morning tea he’d realised he was probably on the wrong colour, so he changed over the same colour as me, the elusive JP had steered clear of his offerings so far. Brod’s mum had made a cake and we enjoyed a nice cuppa and some lovely sponge cake and chatted about our success so far, we were both sitting at around eight fish each. I love this type of fishing, sight casting, casting into shadows, casting under trees, using light gear with the drag set just right. Sootys and JP’s hit hard and you need to let them take line on that initial run, this is especially the case when Tarpon are on the bite, they are very soft around the mouth and you lose a lot more Tarpon than any other species. A good percentage of fish landed are actually seen taking the lure, its heart in your mouth stuff and really gets the adrenalin pumping. 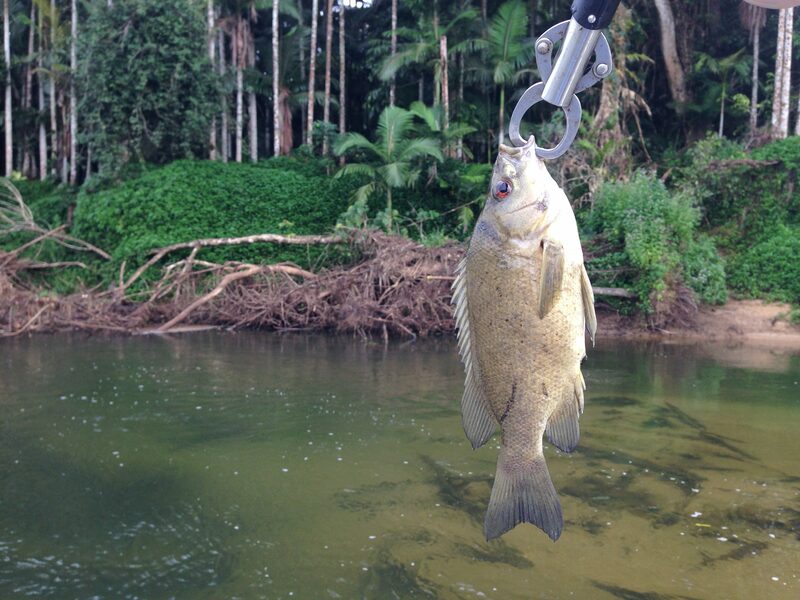 Not long after morning tea the inevitable happened, I was putting Brod onto all my favourite spots, getting him to cast here, cast there, then it happened, he landed his first Jungle Perch, he was wrapped and so was I, it’s a great thrill to land a species for the first time, and he was over the moon. 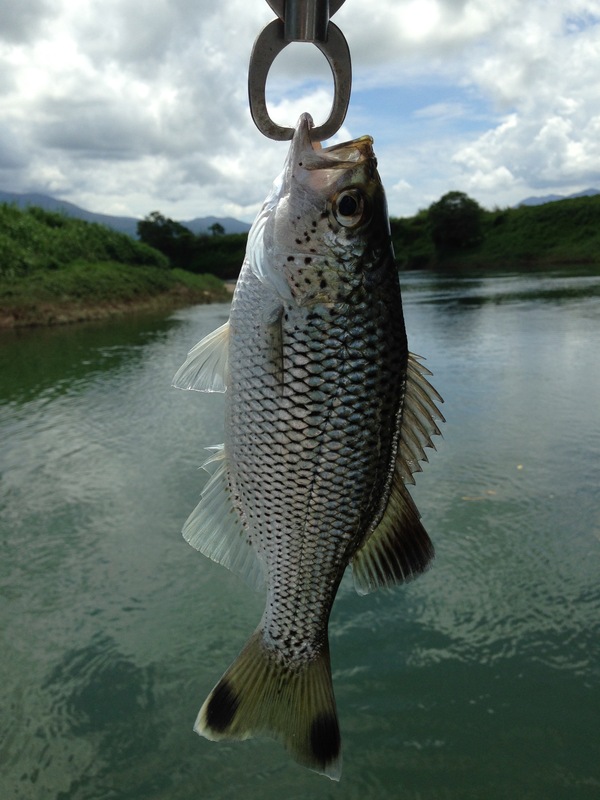 The achievement is made all the more thrilling because you know the skills you have had to employ to land this fish. Casting in under trees and between branches trying to coax a strike, you’re aim getting better and better with each trip, until you can land a lure within inches of its intended target. The ice was broken, on we went, we came to a stretch of faster flowing water and swapped our crankbaits for poppers, three casts and Brod was on again, a nice solid Sooty. Subsequent casts had plenty of interest with several fish thrashing about the lures. 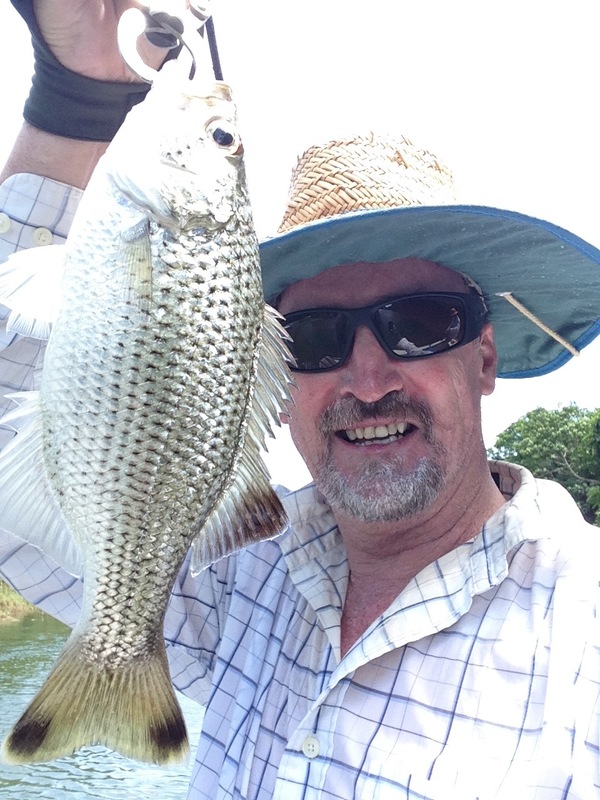 Until the dream of many fisherman, Brod nailed two fish on the one lure, a Jungle Perch and a Sooty, he lifted them into the boat and the celebrations begun, what a day this was turning into. The poppers continued to produce plenty of interest and land lots of fish. It was early afternoon and time for a swim, we picked a shallow sandy area, had a quick scan for the giant lizards that inhabit these waterways, then plunged into the beautifully refreshing waters to cool off. By this stage the poor electric had drained the battery, we had spent a bit of time powering back upstream retrieving lures from snags and out of tree limbs, my theory is, if you’re not getting snagged up, you’re not trying hard enough. But it was time to head home, the trip home saw us shadowing a Jabiru in flight, and witnessing three giant Sea Eagles squabbling over a fish, and some sensational scenery.